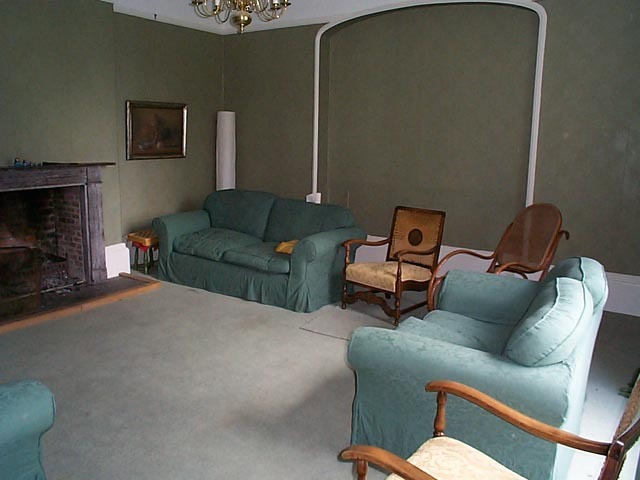 The room without Van der Graaf Generator! Out of interest, on this album Hugh Banton plays a two keyboard and pedals setup that behaves exactly as though it were an organ. The keyboards are a Roland VR760 and a Roland VK7, both of which have 'virtual Hammond' generators and organ drawbar control. 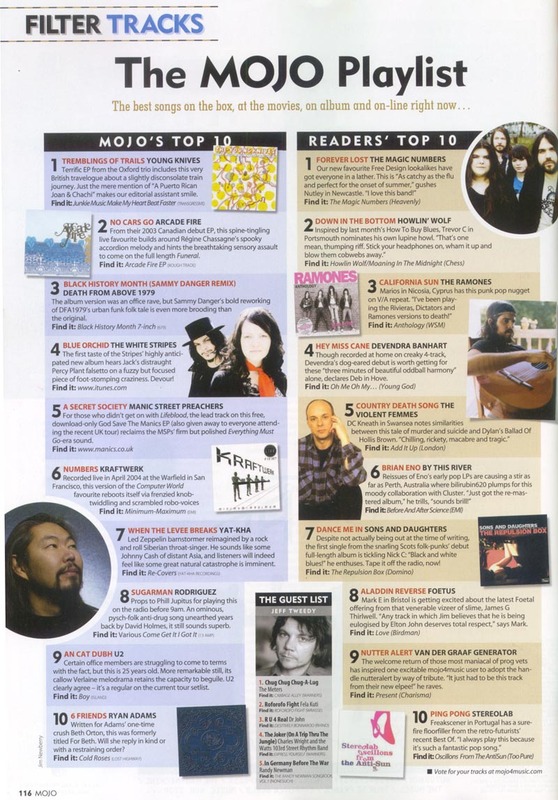 Nutter Alert in Mojo's Readers' Top Ten! "Boring, self indulgent twiddle-twaddle, just like the old days. Go back to sleep guys." - Steve, London. But that didn't stop the BBC naming Present, Album of the Week in early May. The album also reached number 36 in the Italian charts. 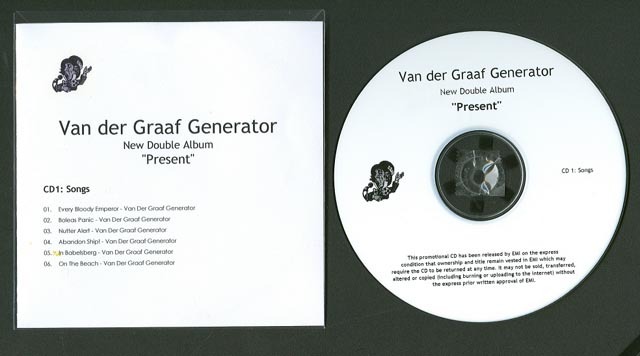 "Van Der Graf Generator haven't recorded together for 27 years, but their new album sounds like it was recorded when they were young and wild. This is probably because when they were young and wild, they sounded like they were ancient, nihilistic and mystical, and on the verge of a long drawn out death. The six elegies, rants and confessions that form the main part of their new double album are part of a heaving, tender, intense present that only this group could imgine. The 'jam' disc that comes with it contains brooding echoes of their savage power and conjures up a dishevelled dream world where Coltrane plays with King Crimson. Nothing has changed in terms of the sound of the group, a sound that is best described as pseudo-medieval modernism. 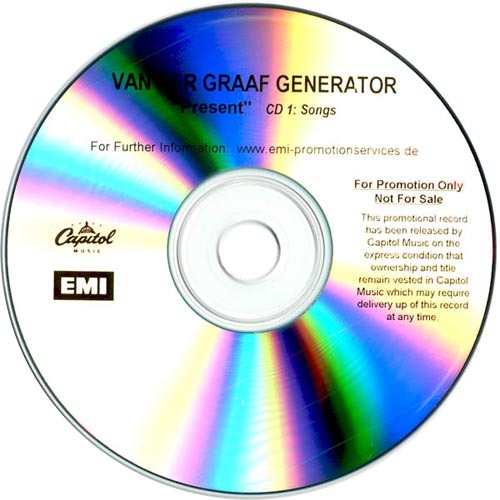 As for Van Der Graaf's frontman Peter Hammill, he is the greatest anti-star of rock; the theatrical leader of a british showmanship that gave us Gabriel, Bowie and Rotten. 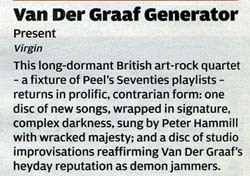 Wrongly bracketed with the posh prog of Yes, ELP and Genesis, VDGG really just went further out there than their peers. That there is music on Present that could easily trip into and out of the classic Generator albums, and also inhabit the awed, appalled worlds Hammill formed and deformed on his astonishing Seventies solo albums, tells those that know all they need to know. Music about death, decay and corruption has never sounded so alive. Burn it: 'Nutter Alert'; 'Crux'"
"Why reactivate the famous Charisma label, with its Mad Hatter logo, the original home to Peter Gabriel's Genesis and Tyneside favourites Lindisfarne? Because another of its acts is making one of rock's most unlikely returns - 27 years on. 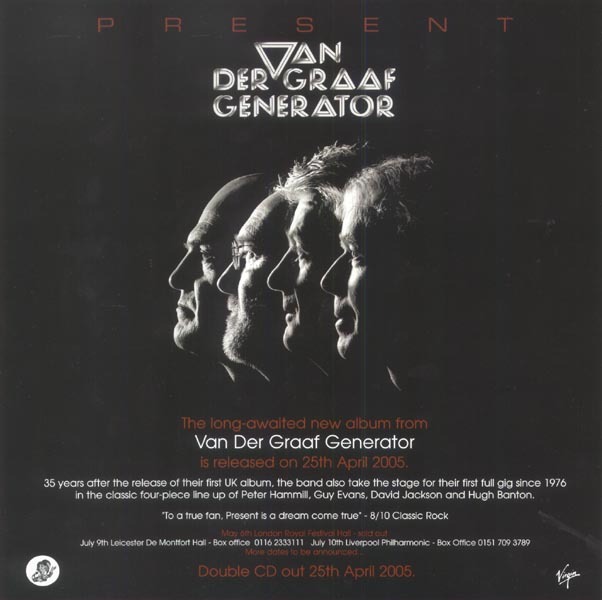 Van Der Graaf Generator never quite became prog-rock juggernauts like Pink Floyd, Yes or Genesis. With a maverick like Peter Hammill at the helm, the songs were too adventurous to get blatantly commercial. 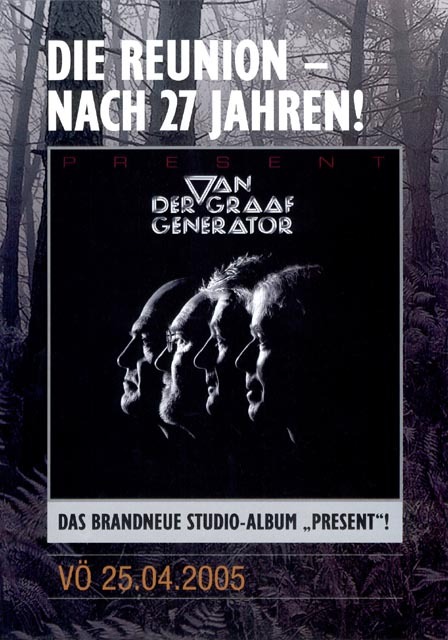 Now, the great news is that Present, a double-CD with six new songs on the first disc and ten instrumentals on the second, retains that spirit. With David Jackson's sax, the jazziness stays intact. Throw in the invention of Hugh Banton on organ/keyboards and Guy Evans on drums and you know it's a worthwhile exercise. Then there's Hammill - raging on opening track Every Bloody Emperor, deranged on Nutter Alert and quietly measured for On The Beach. 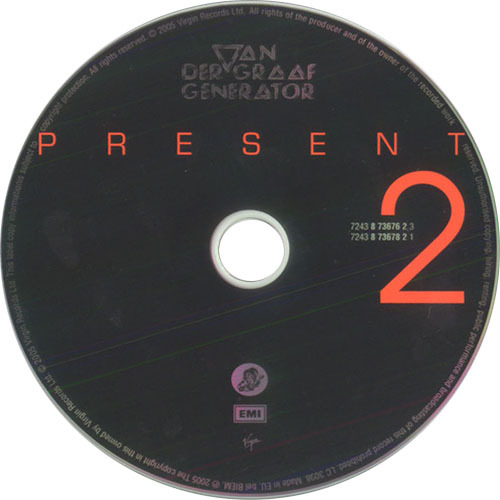 "Nearly 30 years after their last studio album, the prospect of the Generator's return has set hearts a-flutter among the cognoscenti. 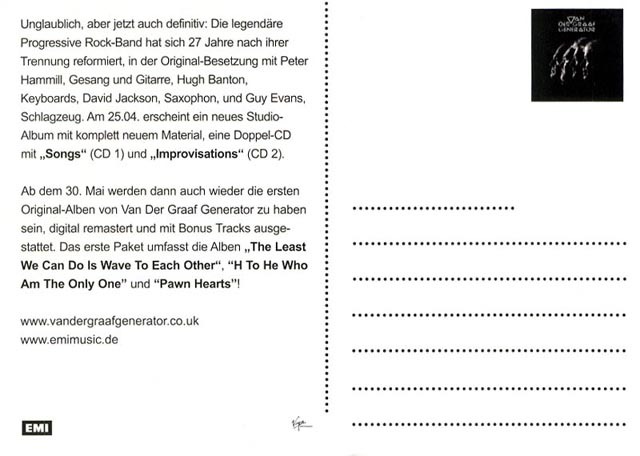 Perhaps wisely, the quartet - it's the Banton/Evans/Jackson/Hammill line-up, usually regarded as the first-choice squad - haven't attempted anything too elaborate, settling for one disc of new songs and another of what they term "improvisations". While the latter ranges from spacey, free-form jams to gruff rockist riffing, the "songs" are also loose and raw. 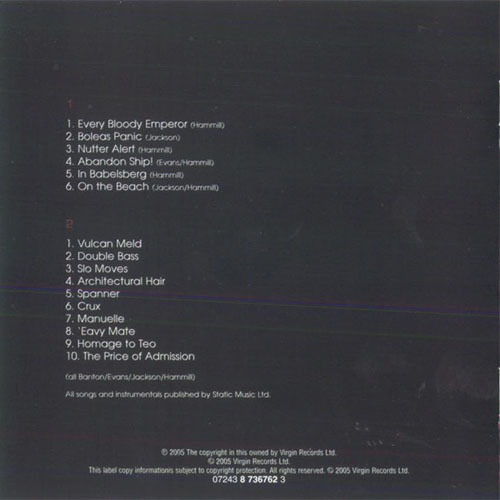 They kick off with Hammill's sepulchral, mock-medieval Every Bloody Emperor, the singer raging angrily against despots of every stripe, then get funkier on Boleas Panic, bluesier on Nuter Alert, free-jazzish on Abandon Ship! and positively balladesque in the drifty, floating On the Beach. 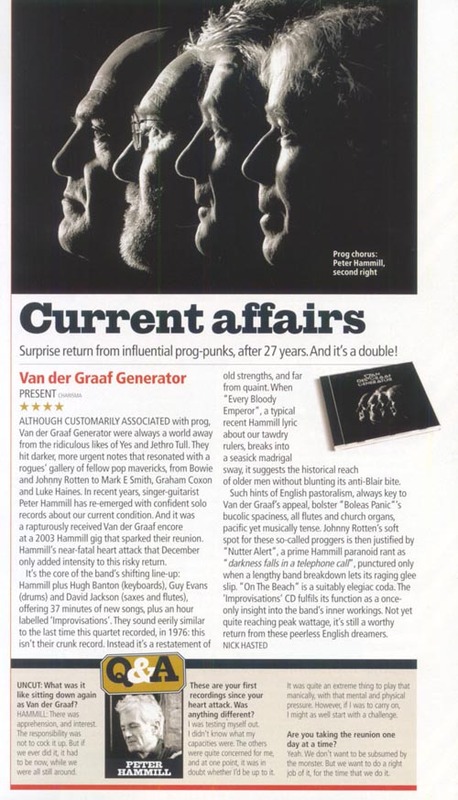 Hammill's voice will always be an acquired taste, and there's an unmistakeable whiff of the 1970's hovering over proceedings (especially in the prog attack of In Babelsberg), but there's enough spark and spirit here to offer clues about why the VdG myth has endured." - Adam Sweeting. There might be understandable trepidation amongst the group's worldwide following: What kind of music will they come up with after so many years away? Will it sound hopelessly outdated? Do they still have the spark? 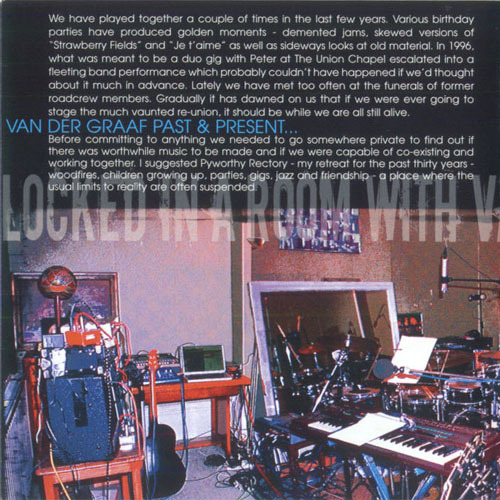 While Present is different than any of the previous offerings that have borne the VdGG appellation (and it should be), all of the ingredients that made the group so revered are back: passion, soulfulness, mature experimentation, delectable chaos, brilliant musicianship, extreme vocalizing, and biting, incisive lyrics. Van der Graaf return to the playing field and, happily, do not fumble the ball. Not by a long shot. The album kicks off with "Every Bloody Emperor," destined to become a VdGG classic. Hammill is in fine form as he paints a less than rosy picture of those in power who believe their "right to rule, divine." Tony Blair will most likely not have the lyrics tacked onto his bulletin board (neither will Dubya for that matter, or any other world leader). Starting off serenely, with Jaxon offering up some majestic flute fills, the song quickly turns into a disorienting waltz. When Peter sings the line "spinning and spinning and spinning into his own decline," the music effortlessly corresponds, on the verge of losing control without ever quite doing so. We "serfs and slaves" can only helplessly watch as our world seems to whirl off its hinges. It's not exactly Bobby McFerrin's "Don't Worry, Be Happy" but there's something uplifting about Hammill's willingness to confront things as they are (or, at least, as a large percentage of the population sees them to be). In "Boleas Panic," Jaxon leads the band through a 6/4 strut that, once it gets going, proves beyond a shadow of a doubt the devious spark is back. Banton's distorted, crunching chordal work elevates the tune to manic intensity, while Evans effortlessly anchors the whole thing. No matter what time signature Guy plays in, his brilliant execution of it lends a smooth, mature feel where lesser drummers might devolve the piece into a chaotic mess. In "Nutter Alert," Hammill sings of an acquaintance (perhaps a former friend) one would rather not run into, someone unhinged to the point of being "a car crash in the making." Rhythmically, it's almost bluesy but the music conveys the fraught vibe that the lyrics warrant. Another classic, this one will be a highlight if they decide to do it in concert. I don't even know where to begin with "Abandon Ship." It's pretty whacked out, but man� is it fun. And fun is really the operative word for the whole album. There is a sense of musicians really enjoying themselves throughout. It's infectious, one can't help but be drawn in. After a nearly thirty year absence, one can feel the joy that these four share in coming together again. 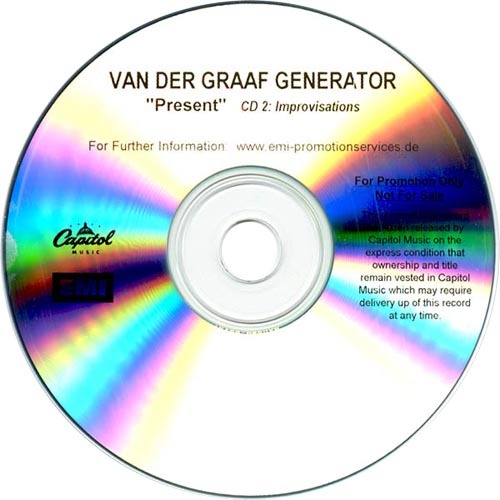 The jubilation continues on the second disc of improvisations, which run the gamut: there's (almost) straight-ahead rock & roll ("Double Bass"), insane organ chording ("Vulcan Meld"), slithering yet raw guitar riffing ("Architectural Hair," "Manuelle"), spacey yet, paradoxically, fiendishly aggressive jamming ("Spanner"), and free-form drumming ala "Arrow" ("'Eavy Mate"). The best thing to do is turn the lights down low and let these brain blasters take you where they will. It's glorious. When Jaxon lets out exuberant cries of "Oh yeah!" and "Hey!" on "Double Bass," "Crux," and "Eavy Mate," you almost want to yelp out with him. 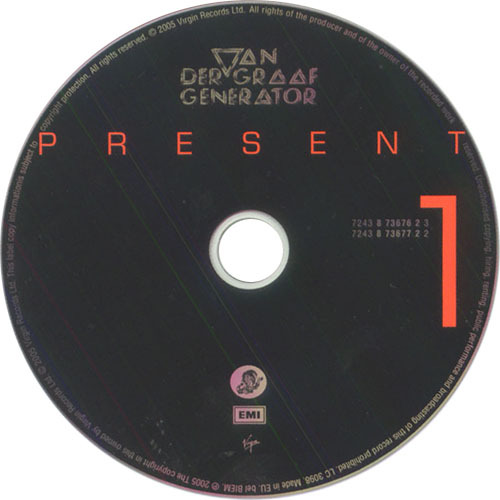 The cover of Present shows four men in their fifties, gray-haired and possessing a lot less hair than in days of yore. But if you don't look at the photo and just listen, you'll swear you're hearing a bunch of fired-up lads in their prime, catching the lightning in the bottle and jamming with spirited glee. This music is now. This music is. 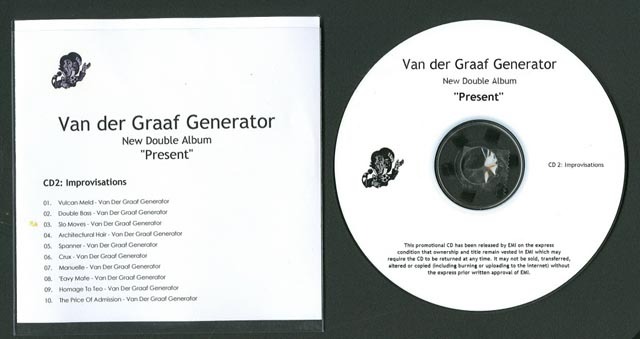 We're in the 'present' and Van der Graaf make it a great place to be. Damn� it's good to have them back. 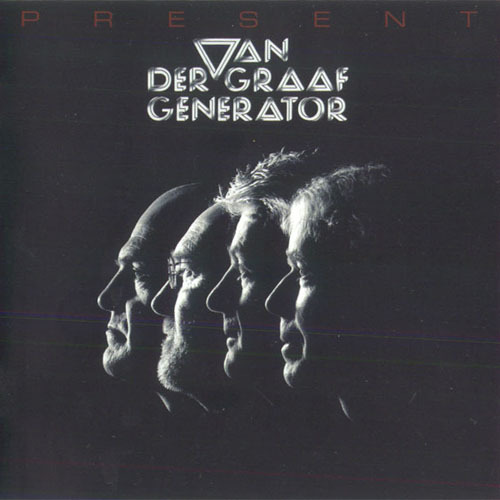 "Without any mid-80s Eurodisco, rewrites, or guest collaborations to have sullied their memory, the Peter Hammill - Hugh Banton - David Jackson - Guy Evans line-up of Van Der Graaf Generator simply pick up where they left off in 1976. With its refreshingly common-room titles like Nutter Alert and Abandon Ship!, Present shows that VDGG have wisely bided their time and re-emerged victorious. Any concerns about the enterprise are speedily dismissed on the opening Every Bloody Emperor, with its teetering sax lines, maniacal church organ and clattering drums. It is, fortunately, business as usual. And Hammill, blaring out lines such as "Every bloody emperor has got his hand up history's skirt" and phrases such as "hair-shirt" over such muscular backing, makes you realise that no matter how great it is hearing his quiet and opaque solo work, to hear him wailing away again is so tremendously reassuring. Boleas Panic, with its scorching guitar behind Jackson's riffing, is something else. The tender On The Beach acts as a reminder that for all their swagger, their restraint was an equally important weapon in their armoury. 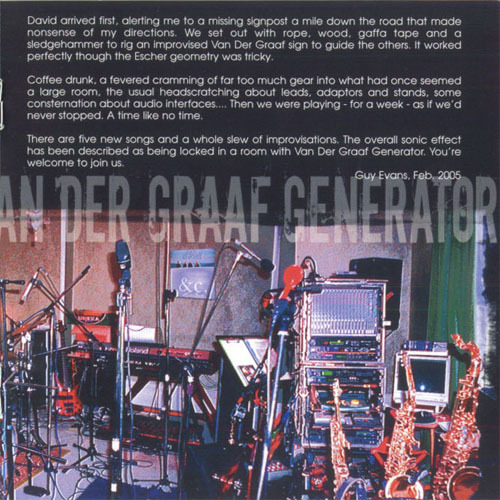 And a second disc of Long Hello-type improvisations that veer towards Ornette Coleman and trance means that every kind of VDGG follower will be sated. The unexpected nature of it makes it all the more pleasant. With Present, the reunion shows, and the prospect of a full catalogue remaster, 2005 is a magnificent return for the most magnificant of groups, always the purest and most remote of the whole prog bandwagon. And it's not on a mail order or internet company, either, it's right back there in the belly of the beast on EMI. The giant has reactivated the Charisma label (where the group were the first signings back in the day) for it, making it all the sweeter. 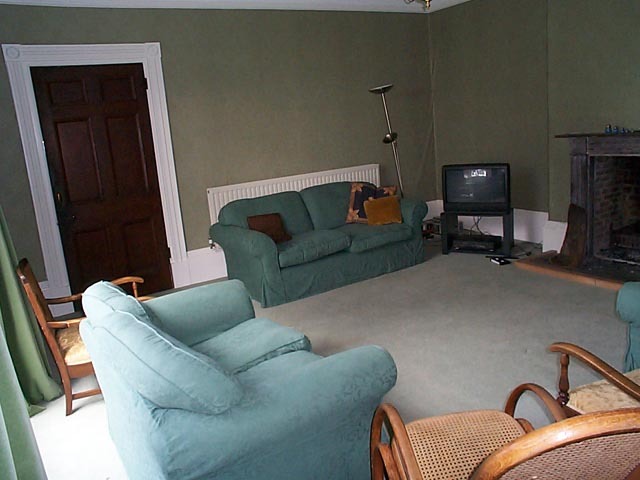 The five stars are not some awestruck fan delighted the past has returned. It really is that good." - Daryl Easlea. Ultra-prog vets' first studio album in 28 years. Surprise return from influential prog-punks, after 27 years. 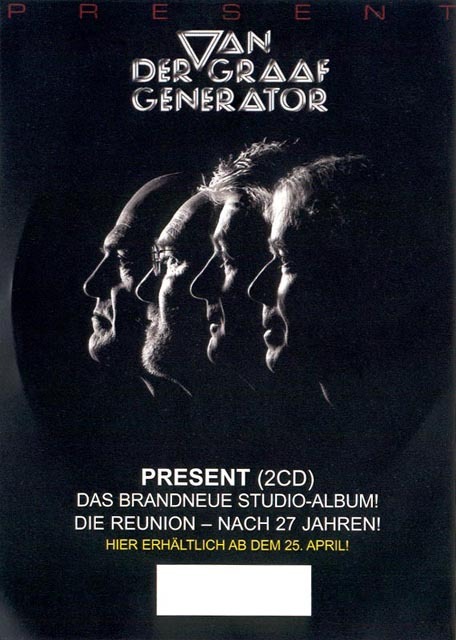 "Although customarily associated with prog, Van der Graaf Generator were always a world away from the ridiculous likes of Yes and Jethro Tull. They hit darker, more urgent notes that resonated with a rogues' gallery of fellow pop mavericks, from Bowie and Johnny Rotten to Mark E Smith, Graham Coxon and Luke Haines. In recent years, singer-guitarist Peter Hammill has re-emerged with confident solo records about our current condition. 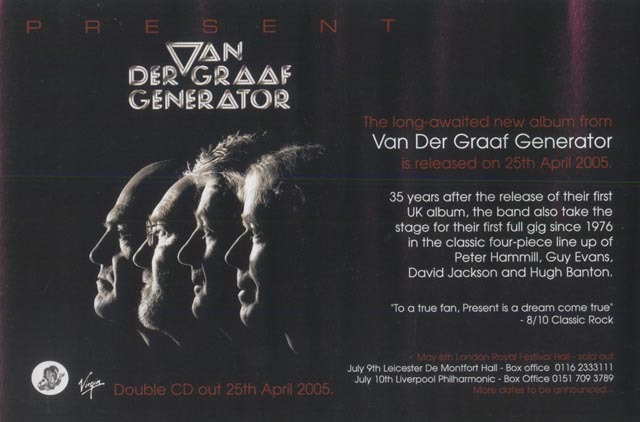 And it was a rapturously received Van der Graaf encore at a 2003 Hammill gig that sparked their reunion. Hammill's near-fatal heart attack that December only added intensity to this risky return. It's the core of the band's shifting line-up: Hammill plus Hugh Banton (keyboards), Guy Evans (drums) and David Jackson (saxes and flutes), offering 37 minutes of new songs, plus an hour labelled 'Improvisations'. They sound eerily similar to the last time this quartet recorded, in 1976: this isn't crunk record. Instead it's a restatement of old strengths, and far from quaint. When "Every Bloody Emperor", a typical recent Hammill lyric about our tawdry rulers, breaks into a seasick madrigal sway, it suggests the historical reach of older men without blunting its anti-Blair bite. There is also additional material on the Reunion page. 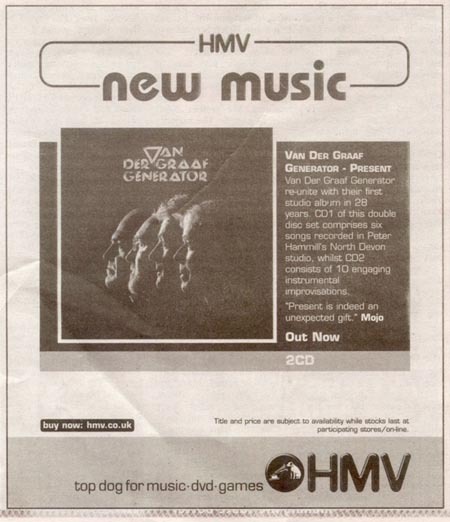 HMV advert in The Times (29th April).